The Ketogenic diet is getting a lot of press these days with many people seeing impressive results from reducing carbs, increasing protein and fats and eating the keto way. Like any eating plan, the trick is finding simple, delicious and affordable recipes that will help you stick to your goals, particularly when you are on the go or at work. Here are five of our favourite keto lunch ideas, that are easy and quick to prepare and so tasty that you won’t feel like you are missing out on anything at all. This meal is simple to create, full of protein and fats and can be made up in advance and warmed through in the microwave at lunchtime. To make, sear beef fillet for 2-4 minutes each side in a large pan in butter (or until it is cooked to your liking). Remove from pan and allow to rest for 5-10 minutes. While the beef is resting, add the baby spinach to the same pan and cook gently for 2-3 minutes until it is wilted. Remove from heat. Slice the beef thinly and season with salt and pepper. To assemble, add spinach to plate or container, top with beef and avocado slices. Drizzle with tahini and coconut oil and finish with chopped almonds. High in omega-3 fatty acids and protein, tuna steaks are a great addition to any keto diet. If you are unable to get fresh tuna fillets try salmon instead which also works great in this salad. Combine all dressing ingredients in a small bowl and mix well, set aside. Coat tuna fillet in sesame seeds until fully covered. In a frypan heat peanut oil and add tuna, searing each side until the tuna and sesame seeds and golden (approx 2-3 minutes each side). Remove from heat, allow to cool slightly and slice thinly. To assemble salad add rocket, edamame, and avocado to a bowl. Drizzle with dressing and top with tuna slices. Season with salt and pepper. Blueberries, spinach, chicken, walnuts, and avocado combine to make a delicious salad that is high in protein, healthy fats, vitamin C and antioxidants – perfect for a keto diet with the added bonus of giving your skin a gorgeous inner glow. To make chop walnuts, spinach leaves, chicken and avocado and combine. Serve topped with fresh blueberries and drizzle with olive oil and lemon juice and season with cracked pepper. This is such a simple dish which can be made up in advance, stored in an airtight container and reheated at work. Not only is it great for lunch it is also perfect for breakfast, brunch or a quick snack at any time of the day. Simply halve an avocado and remove the stone, crack a small egg into the center hole and top one end with cheddar cheese. Bake in a pre-heated oven (180 Celsius), for approximately 10 minutes so the egg white is cooked through, the cheese is golden and the yolk is still slightly runny. Season with salt and pepper. Protein-packed prawns are a perfect keto-friendly food with next to no carbs. The addition of bocconcini gives some added fat and the tomatoes are one of the few fruits suitable for a ketogenic diet. Heat 1 tablespoon of olive or coconut oil in a frypan or grill (medium heat) and add garlic and prawns. Fry for a minute or two on each side until prawns are golden and cooked through. Remove from heat and squeeze over the juice of half a lemon. To assemble the salad, layer sliced tomatoes and halved bocconcini balls in a shallow bowl. Top with cooked prawns and drizzle over garlic and lemon juices. Sprinkle with parsley, season with salt and pepper and drizzle with remaining olive oil. Serve with half a lemon. Try incorporating these nutritious and delicious keto-friendly lunches into your workday. Need a post-lunch sweet treat? Try these delicious Superfood Cacao Chocolate Coasted Hazelnuts. Want a quick and reliable way to check if your body is in ketosis? 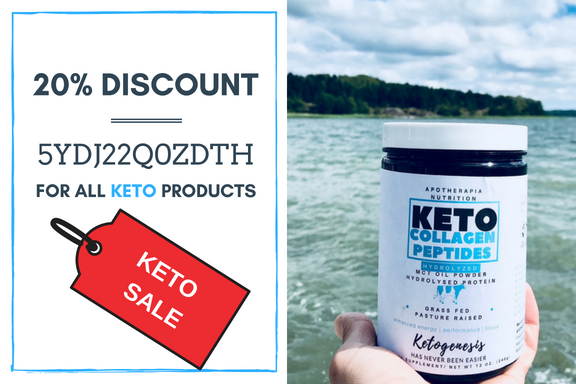 Try Ketosis Testing Strips.